On March 22, 1866, five men with faith in the Sewanee dream, led by Bishop Charles T. Quintard of the Episcopal Diocese of Tennessee and Maj. George R. Fairbanks, a former Confederate Commissary officer, met at a site on the Cumberland Plateau where the University of the South buildings stood before being destroyed during the Civil War. Quintard noted the group "asked the blessing of the great Head of the Church on our undertaking. We recited the Apostles' Creed and made the grand old woods ring with the 'Gloria in Excelsis.'" Aided by local workmen, the leaders planted a simple wooden cross 12 feet high at what is now St. Luke's Hall and declared a refounding of the university. Today motorists driving during the evening from Cowan to Sewanee on Highway 41A see another cross, a 60-foot tall edifice illuminated by lights. This one rose almost six decades later in the fall of 1921, when local officials contemplated a giant crucifix on the bluff overlooking the fields of Franklin County. In a morning chapel talk, Vice Chancellor Dr. Ben Finney described the community's interest in honoring those who had recently fallen in the Great War, "The War to End All Wars." Students went to a nearby site to gather stones for a rough foundation for the cross. Proceeds from selling the first edition of the Sewanee Cook Book started an endowment to pay for lighting the structure.
' World War I — "To the sons of Sewanee who answered their country's call to service in the World War 1917-1918." ' World War II — "To those from the university, the military academy, Sewanee, and all Franklin County in World War II 1941-1945." ' Korean War — "To the students and citizens of Sewanee and to the citizens of Franklin County who served this country in the Korean War 1950-1953." ' Vietnam War — "To the men and women of the University of Sewanee and of Franklin County who answered their call to serve in the Vietnam War 1965-1972." ' Desert Storm — "To the men and women of the University of Sewanee, and of Franklin County who served in Desert Storm 1991." 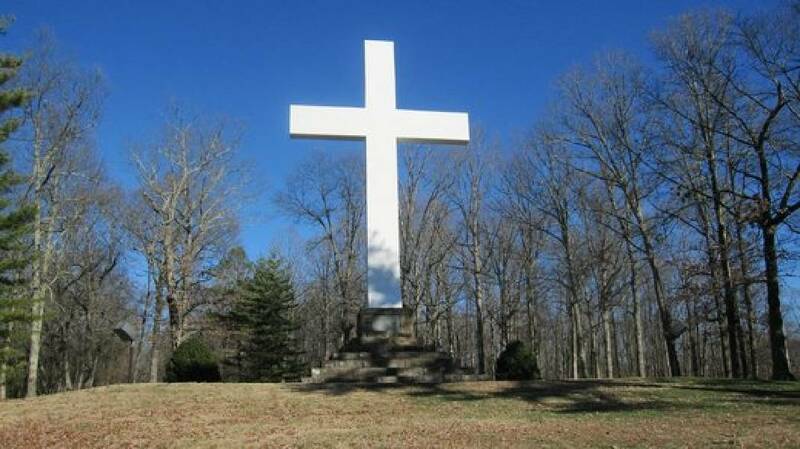 To reach the cross one leaves the school on Tennessee Avenue and drives down a long unpaved road towards the bluff overlooking the valley. The memorial stands in the middle of the road, which loops around the structure. The 60-foot cross has served many purposes over the years: a landmark for pilots in the early days of commercial flight, a marker for hikers stranded in the forest on dark and frigid nights, a beacon of inspiration for children in the valley, a site for a wedding, a place to pray for the lives of those gone before and a respite to enjoy nature's beauty. One visitor said the tsite is "where God goes to think." Another described it as "a special place where they can go with the burdens of the world on their shoulders and they can leave with peace." On March 22, 2016, a third cross, a simple wooden one, was created on the main campus to help celebrate the sesquicentennial of Sewanee's refounding. The small symbol is supposed to have been built from wood remnants of the original houses of the first Vice Chancellor Bishop Leonidas Polk, a revered Confederate general who was killed at Pine Mountain, Ga., during the Atlanta campaign, and co-founder George Fairbanks. It was intended "to be a lasting memento of the historical moment and a permanent home in All Saints Chapel, the main place of worship on the campus." A visit to the giant cross creates a lasting impression. The blooming of flowers in the spring and the changing of colors in the fall add to the beauty and serenity of the experience. Author James Waring McGrady in 1982 reflected, "We cannot remember everything but we can do our part to lift up, to dignify, and to respect the history and human endeavor of our little part of a very vast world." Jerry Summers is an attorney with Summers, Rodgers and Rufolo. Frank "Mickey" Robbins is an investment adviser with Patten and Patten. Thanks go to the Franklin County Historical Society and University of the South Library. For more, visit Chattahistoricalassoc.org.